» System will carry about five million passengers a day. Dozens of other Chinese cities are spending billions of dollars on similar grade-separated transit systems. If China’s massive investment in high-speed rail is impressive, its huge spending binge in local rapid transit is remarkable. And nowhere is that record more dramatic than in Shanghai, the world’s most populous city proper. Just fifteen years after the first segment of its first metro line opened, the city’s metro network has gained the title as the world’s longest with the opening of a section of Line 10 last week. This followed years of continuous construction and the opening of pieces of Lines 2, 9, and 11 over the past month. In anticipation of the inauguration of the city’s Expo 2010 event on May 1st, Line 13 will open sometime in the next two weeks. Now Shanghai offers 282 stations and 420 km (261 mi) of lines, compared to 408 km in London and 368 km in New York, which now have the world’s second and third-largest rapid transit networks. Unlike those cities, which have only minor line extensions planned, Shanghai’s expansion plans are only half complete: not only does the city have 140 km of more lines currently under construction and intended for service by 2012, but it has an additional 300 km planned to be ready for operations by 2020, by which time this city alone will have more rapid transit mileage than the entire country of Japan. The Shanghai Metro is now capable of handling about five million passengers a day; the system is likely to become the world’s most-used, passing Tokyo and Moscow, by the time the full construction program is complete. Beijing is pursuing a similarly extension metro expansion project, but these cities aren’t alone: twelve Chinese municipalities currently have rapid transit, nineteen more have systems under construction, and an additional seventeen new networks are in planning. The national government has committed $150 billion to the projects by 2015, though additional funds originate from the municipalities themselves, such as the progressive and independent City of Shanghai. It’s a country-wide investment in urban transportation unparalleled in human history. The American government, managing a much wealthier country than China, typically commits about two billion dollars a year to transit capital projects nationwide. China’s aggressive efforts are a response to the country’s rapid urbanization, which has brought tens of millions of rural peasants into the cities as a result of increasing economic development. Though the Chinese automobile market is now larger than that of the United States, when compared on a per capita basis, it is still relatively small, especially considering that most Chinese car purchases are of first vehicles, not second or third, as are typical American consumer investments. This means that these quickly growing cities must respond with significant spending on improved public transportation — and they’ve chosen rapid transit as their preferred technology. Specifically, Shanghai’s effort is an attempt to avoid American-style commuting habits even as its population increases in prosperity. With a per capita GDP three times the national average, Shanghai must endeavor to ensure that its growing number of middle-class inhabitants don’t clog the streets with their cars. The European and North American experience shows that it can be done: In the first half of the 20th century, cities like New York, Berlin, and London reacted to a growing population and densification of land use by constructing extensive rapid transit networks and the results today are cities with high rates of public transportation use in spite of wealthy populations; Shanghai is likely to follow in the same mold. But the extent and rapidity by which Shanghai is expanding its system reinforces the high-speed rail-driven sense that the West is falling behind, at least in infrastructure investment. Though no American and European cities are growing as quickly as their Chinese counterparts, there are significant demands for transportation improvements that are being unmet in virtually every major Western metropolitan region, with the possible exception of Madrid, Barcelona, and Paris, which are all spending billions to extend their transit networks out of the traditional urban core and into near suburbs. These neighborhoods have for years been deprived of adequate public transportation despite a real demand; most regions, however, aren’t spending on new line capacity. Unlike the U.S. or Europe, China benefits from strong economic growth, making these investments more feasible, especially since construction costs are lower. Nonetheless, if Shanghai’s construction is so extensive as to be impossible to replicate in the more affluent parts of the world, current efforts in most major American and European cities are modest, doing very little in terms of transportation to respond to significant increases in population since the first half of the 20th century. They’re not making much of an effort to prepare for their increasingly urban futures by building new transit links. 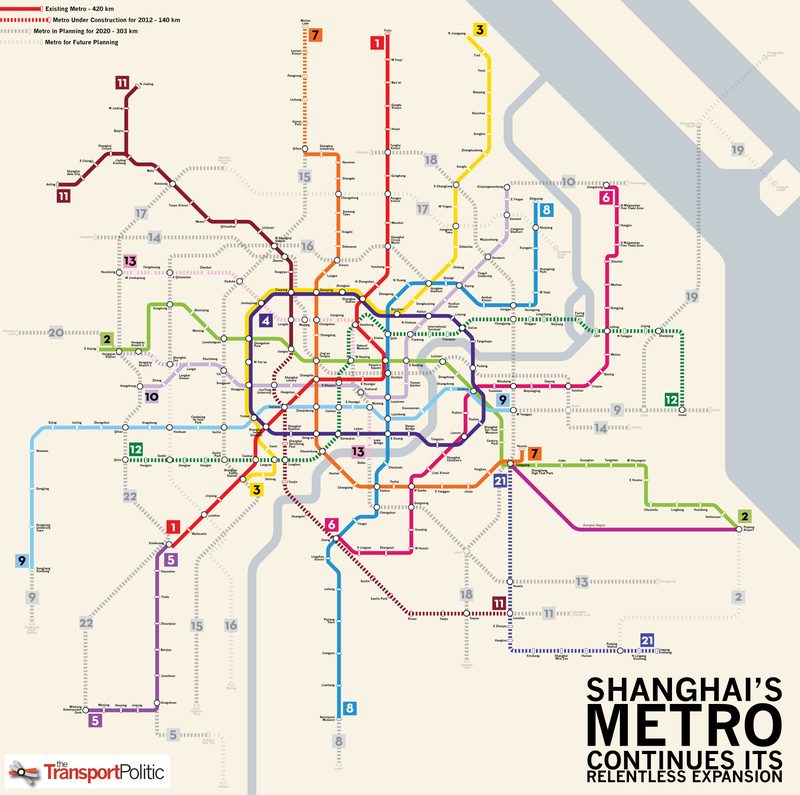 Image my own work but based on standard Shanghai Metro Map. It’s interesting how rarely people in the US speak of the future in any positive way. Usually it’s just given as a series of calamities and the possible end of the world, and people seem to forget that the future is only a bad thing when there is no preparation for it. China isn’t bracing itself for a grim future–it’s laying the groundwork for a great future. Transit development in the USA on this sort of scale would be fantastic for the country, helping to reduce unemployment and alleviate poverty, all while reducing greenhouse gas emissions and traffic congestion. The reason I see a grim future is that in my opinion it is far too late for us to prepare for the future to mitigate the problems we will face in the next century. Ask a simple question – what is the maximum *sustainable* human population level for the planet. By sustainable, I mean without consuming any fossil fuels. It isn’t just transportation – consider food production. We use lots of chemical fertilizers (nitrogen enhanced with ammonia made from natural gas), chemical pesticides (essentially all petrochemicals), or even basic potassium which we mine in various spots around the world and use it as a part of fertilizer to boost crop yields. Without any of this, how much food could be produced? And this isn’t just an academic thought experiment. World oil production will peak at some point and then go into terminal decline, and it is believed that this will happen sometime within a decade if it hasn’t already happened. People have thought long and hard about these questions, and the best guess that people have is that the maximum sustainable world human population is somewhere in the neighborhood of 1.5-2 billion people. And yet we currently have nearly 7 billion and the projections are that in the absence of other limits, the world will have 9 billion at some point in the not too distant future. If all of these things are true, there isn’t any planning that is going to help. You cannot reconcile these two things without a grim future of some sort. You can only hope that there is some mistake of some sort in the calculations, but that’s not planning. Now make no mistake – if the U.S. had transit development like what China is doing, the future would be less grim. Unfortunately we committed ourselves decades ago to roads, cars, and sprawl, and it is hard to undo after it has happened. At the time, I suppose it all seemed like a good idea. And some people apparently still think it is a good idea..
yes, there may be grim times ahead (as there always have been) but why should that stop us from developing and redeveloping our built environment in ways we think will help the next generations to adapt (and with luck, prosper)? instead you seem to suggest that it’s “too late” to do anything meaningful so we should just toss up our hands and say tough luck to our grandkids. sorry, i prefer to spend my time on this planet being a bit more hopeful, and not share your fatalistic attitude towards planning. Wow! You said it, JackRussell. Without getting too much into politics, I think that part of our lack of a positive outlook is influenced by the divisive political situation in the U.S. over the past 40 years, which makes it virtually impossible to get anything done anymore. This is certainly true in regard to mass transit, but also is true for other “big ideas”…would/could the U.S. put a man on the moon or build the Hoover Dam today? Probably not. It seems like we’re giving up on NASA and space exploration (which is a tiny part of our budget). Consider the massive amounts of money spent on the various wars we’ve been involved in over the past 30 years (much of which is just waste going to fatten military contractors). For 1/10 as much money as was spent, we could have built a mass transit network (high-speed rail, heavy rail subways for the larger cities, light rail networks like Germany’s [i]stadtbahn[/i] for smaller cities) that would have been the envy of the world. We could easily afford to build a Shanghai-type system for Los Angeles, but we’re not. I don’t know if the U.S. can break out of our car culture; we’re trapped by what James Kunstler calls “the psychology of previous investment”. Maybe the upcoming oil scarcity crisis will cause people to reconsider transit and urbanism, but by that time we may lack the capital to do anything about it. You would never see this kind of development ins transit in this country. Between politics, unions, individual landowner rights, regulations, etc., I would shudder to think how much it’d cost to expand infrastructure in the way china has (I get the feeling eminent domain challenges usually favor the gov’t over there). Don’t get me wrong, I’d love to see $100,000,000,000 set aside immediately for some sort of construction, but living in NYC, and seeing how much the SAS costs, well, that $100B might not get even NYC fully up to speed. There’s also a massive cultural divide. The car is such an integral part of the american fabric at this point that getting people to come into more densely packed communities from their leafy burbs is not goign ot be easy. I think this trend may show signs of change with the current generation though, and a return of young professionals to large cities. But yes, I would love to see massive infrastructure spending in the US. It’ll never happen though. You compared line lengths, but it’s also interstign to compare the numebr of stations. Shanghai has 282 stations, more than London (270) but way less than NYC (468). New York seems to really pack in stations, which may explain why they have so many express services. (Alternatiively, you could say their infrastucture allows express services, whcih in turn supports a higher station density… it’s a chicken-and-egg thing). A lot of the political gridlock has to do with attempts to maintain an empire. Wars and the military are expensive, and yet there are strong political forces in this country that feel it important that we spend our money in this way. Why they feel it important is an interesting question – it has to do to a degree with our image of ourselves. I talk to conservatives sometimes, and I get the sense that they are stuck in a WWII mindset where we are the ones liberating the world from evil, and to them it is important to them that we maintain this position in the world (assuming it is even possible). And yet if you step back and take a broader view of how we have used our forces, it isn’t always a pretty picture. Shanghai’s stations may also be spaced out because the metro serves as a commuter rail, which it lacks. Station density as high as New York’s would make covering the distances of Shanghai’s metro too time-consuming to be useful. Yonah – I’m not sure which cities in Europe have an increasingly urban future? Taking the UK as an example 80% of the population live in an urban area and almost all of those living in the countryside are those who have chosen to do so because they were able to leave the urban environment. There’s no more farmers to move in. Unless immigration accelerates and birth rates rise I think this country (and most of Europe) are as urban as they are ever going to get. wow you really have to look at that map at full size to truely appreciate the scale of the system that they are building. i take it no express lines, is there a reason these were not built? New York’s station density is also a function of how the system was built – cut and cover tunnels, relatively shallow. As far as a lack of express lines, these are really quite rare around the world. true, but its interesting to note that when building an extensive modern first-class subway system today (as shanghai is) they decided not to have an express tracks. most subway systems built are minimal so they wouldnt even remotely consider express lines, but at this scope i suppose it would have been potentially possible. No, most subway systems are not minimal. The reason they don’t have express tracks is that they have no need for them. Modern signaling, a wide loading gauge, and long trains provide extra capacity, while high-acceleration trains, gentler curves, and wider stop spacing provide higher average speeds, both at much lower cost than four-tracking the line. As a single exception, Tokyo has four-track passing sections with timed overtakes on two of its subway lines; however, those are only possible due to Tokyo’s exceptional schedule adherence. Shanghai probably wishes line 1 had had four tracks. It’s building relief lines instead; the cost is nearly the same as that of four-tracking line 1, and it serves additional neighborhoods. Unfortunately, line 8 is a complete dud – its northern arm misses line 4, and has no useful east-west connection except People’s Square. But line 10, which has neither of those problems, may provide some relief. Philadelphia and Chicago have express tracks. Shanghai is building this way because it is a technology appropriate to its needs and means. It doesn’t mean it’s because it is smarter or more optimistic. We’ll all concede that subways are the most cost-effective way to move lots of people. When cars were beyond people’s means, NYC built subways too. Suburbs and cars exist in part because as they grew richer, free, politically-empowered people preferred windows on 4 sides of their house and a patch of grass at their doorstep, and they made it happen. Plenty of American cities are planning great, optimistic infrastructure, it just happens not be be The Worlds Longest Subway. It’s also that our political priorities are elsewhere…a choice free people are free to make. They vote with their ballots, pocketbooks, and arses and choose some transit…and not as much as the fanboys (me among them) would like…but that doesn’t make them dumber or more pessimistic. It is a common, and dangerous misunderstanding to claim that the disastrous transit decisions of the last 50 years represent the simple consequence of the free choices of empowered individuals. The federal government alone spent hundreds of billions of dollars (in today’s money) creating a vast, highly subsidized road network, just as the private corporations who ran most of America’s transit systems were ripping out their infrastructure. At the same time, government zoning regulations required developers to provide parking, which meant that developments had to be more spread out, and built on cheaper land. This created a vicious cycle in which people became more and more dependent on cars. But make no mistake: it was started by a poor set of policy choices, and can be reversed by a good set of policy choices. It was definitely NOT about “windows on 4 sides of their house and a patch of grass at their doorstep”. In fact, suburbs with a patch of grass on the doorstep (which is where I live) were made possible by the streetcar. Los Angeles was created around the world’s largest transit network. There’s nothing about having a single family house and a bit of yard that is incompatible with a mass transit based transportation system. I have windows on 4 sides of my house, and a nice bit of yard, and I don’t own a car. Sadly we can’t even get together enough money to build a station at 10th and 41st in New York on an extension that is already being built to the 7 line. The cost would be something like $500 million to serve one of the densest areas in the country. Just pathetic if you ask me. It seems almost impossible nowadays in America to build true heavy rail rapid transit. If we do build it it takes 50 years like the Second Avenue Subway. I mean lots of places don’t warrant it but lots of larger cities do. I mean like why not make the Purple Line in DC heavy rail rapid transit? I mean there is no room to build out further exurbs in lots of American cities anymore. Are people really going to live a two hour commute away? We should be encouraging heavy rail rapid transit to encourage some densification if for nothing else. Anyways as we look with envy on China, hopefully America will wake up in the next century and build better urban environments that are have more transit and are more liveable. Then we can connect these cities with high speed rail. The tricky part is going to be finding the money. I am happy that China looked at the future and realized that 1.3 billion Chinese all trying to buy let alone drive cars at the same time would be a calamity of epic proportions in securing necessary oil, space for roads, space for parking, even worse air, etc… I hope they took a look at us and said nope, we will go a different route. If the US were a centralized state with top-down planning, we could be doing the same. However, we force our cities to do the planning and compete for limited funds. We move the opposite direction (in more than one way). The Second Avenue subway would already be built if the Federal government demanded, instead of MTA waiting around to find enough political “will” and money waiting around. I’m also curious, do the Chinese have to go through the important yet tedious process we call NEPA? China’s auto sales are exploding as we speak; it is building an expressway system as impressive as the US’s interstate system. But, since China is also building the national high-speed rail network, the intercity express rail and the metro systems in major cities, we should expect to see a very different car usage pattern from the US. It is likely that public transit is used for commuting to work while cars are used for leisure, social and travel. It is really interesting to see what kind of system and usage pattern eventually emerge out of China’s frenzy to build its transportation infrastructure. One wonders how a car share program would work in China. Seems like this could be lucrative given the points you make. These sort of “world’s longest” descriptors can be misleading — especially when you consider that in the case of Tokyo all of the suburban railways that run through to the Metro (and many that don’t) are functionally equivalent to subway/metro lines. They may run at grade in parts, but that’s not really relevant when the trains are high capacity and arrive every few minutes. They’ve made a lot of progress very quickly, but Greater Shanghai still has a long way to go before it has anywhere near the route-miles of rail transit that Greater Tokyo now has. Well after looking at this massive system it makes sense in that it services a very large mega city so it being the largest is ok. But I think that the US could maybe move up in rank if it where to start expanding the Wasingtion DC Metro subways south of DC to Fredricksburg where there is lots of traffic and no subway or light rail lines. They could also consder adding on to the Baltmore heavy rail subway with new heavy rail lines and link it up to the green line on the Wasington DC subway turning it into a mega subway system. LA could possibly start adding many miles of new heavy rail subway to give this thing a run for it’s money. This means that these quickly growing cities must respond with significant spending on improved public transportation — and they’ve chosen rapid transit as their preferred technology. “Rapid transit” is a service type, not a technology. Rapid transit can be delivered on land by either bus or rail. It’s important to note that while rail is appropriately the focus in the denser parts of the biggest cities, secondary markets are making huge invesments in Bus Rapid Transit all over China. China is trying to choose the best tool for each corridor to provide complete rapid transit networks. They understand that no technology is right everywhere. We might have a disagreement about this, but it is my understanding that the term “rapid transit,” when used alone (i.e., not with “bus” or “personal” attached), refers to rail-based transit operating in its own right-of-way. At least the Encyclopaedia Britannica agrees with me. That said, you’re right that you can get similar types of service from buses, though capacity is much lower. I’d like to throw a bit of cold water on this. While Shanghai’s investment is impressive, its metro should be compared to hybrid rapid transit/commuter systems, such as the Seoul subway or the Tokyo subway plus the JR East commuter network, both of which are still much larger. In addition, not all of Shanghai’s lines are capable of high traffic density. The problem is that the planning is poor, so the lines don’t connect well. Transfers require walking hundreds of meters, and some of the most important transfers in the system, for example Shanghai Railway Station between line 1 and lines 3/4, are out-of-system. This means that while line 1 is bursting at the seams, relief lines such as lines 3 and 8 do not have as much demand, because their connections to major destinations are poor. Another problem is that the circular line, line 4, is not as well thought-out as comparable orbitals, such as Tokyo’s Yamanote and Oedo Lines or Moscow’s line 5. Its station spacing is dense, reducing travel speed, and it shares tracks with line 3 on its western section, reducing frequency on the higher-demand eastern section connecting line 1 with Pudong. Add this to the fact that the Shanghai Railway Station transfer is out of system, and you get that the only easy way to get from line 1 to Pudong is to transfer at People’s Square, which is dangerously overcrowded. Whether this poor planning will lead to high car use in the future is still open. Hong Kong and Singapore both have CBD-monocentric subways and are only beginning to improve crosstown transit connections, but maintain very low car ownership levels. However, they have gas taxes and car taxes, whereas China has gas subsidies (however, those are mostly a welfare program; as China imports more oil and gets richer, its priorities may shift to conservation). In fact, if my data sources are to be trusted, Shanghai already has lower car ownership than the rest of China, despite its much higher incomes. Centralized planning has nothing to do with it. Neither does the lack of freedom. Countries with investment-fueled booms build fast; Japan built infrastructure very fast in the postwar years, and Spain did the same in the last decade. Spain in fact has lower subway construction costs than China, despite its vastly higher wages, and is building subways faster when you account for the fact that Greater Madrid has 5 million people and Shanghai 19 million. I remember it used to be “three rounds and a sound”: clock, sewing machine, bicycle and radio! Alon, car ownership in Shanghai is low probably because drivers have to bid for license plates, a limited number of which are available every year. The goal is to avoid the congestion you find in Beijing. It is popularly believed that Beijing doesn’t follow a similar policy because of the high concentration of officials and well-connected businesspeople, many of whom want to have a car. Hmmm… I didn’t know that. Thanks for the info. Given how terrible transfers were in Beijing when I lived there, I hope for the sake of the Shanghainese that Beijing’s transfers aren’t “better”. Granted they’ve supposedly improved some of the most atrocious- like Xizhimen’s out-of-station 10 minute walk- but some, like Jianguomen and Fuxingmen, are beyond improvement, and from what I’ve heard their new lines aren’t a whole lot better. I guess that just leaves the very low fare to explain high ridership- I think both Beijing’s buses and subway are cheaper than almost anywhere else in China, cheaper even than places like Chongqing. Shanghai Railway Station is a 5-minute out-of-system transfer, but there are two extra penalties there. First, the corridor in between is really crowded, with too much retail and too many people on not enough space. And second, Shanghai Railway Station doesn’t have many ticket vending machines. The TVMs available on the subway in Shanghai don’t sell multi-ride tickets, just single-rides, and they break down all too often. At most stations, it forces you to spend 1-2 extra minutes buying a ticket; at Shanghai Railway Station, where trains dump loads of people without multi-ride tickets, the lines go up to 10 minutes when the TVMs break down. Beijing and Shanghai had followed different strategies from the beginning. Beijing had always been about highways – just look at a BJ map and you’ll see six ring roads and close to ten radiating roads. Yet the traffic congestion kept getting worse. BI has most cars among Chinese cities, about 4 million. Before the Olympic in 2008, BJ started to realize this and catch up. The current plan is have a 561 km metro system by 2015. To relieve the traffic congestion on the ground and to encourage the metro ridership, BJ government has subsided the subway fare – it costs two yuans now regardless distance, the lowest fare in any Chinese cities. Shanghai, on the other hand, has limited car ownership by auctioning limited license plates each and focused on building metro systems. A license plate can cause as much as 40,000 yuans in Shanghai. Alon. Do you know what the story is about Lines 1 and 5 connecting end-to-end? Are they different technologies? I’m about 80% certain that the technology is compatible. The difference is that line 5 has shorter trains, due to lower demand. While it’s fully elevated, line 1 is elevated in that area as well. However, some of the official long-term fantasy maps call for an extension of line 1 to the southern edge of the city, appropriating part of line 5. (On Yonah’s map, it’s represented as line 5). line 1 trains are 3m wide, whereas the ones on line 5 are 2.6. So basically METROPOLITAN Shanghai has a thousand people more than DOWNTOWN Mumbai. That doesn’t really tell us much, does it? No. Those Shanghai inner suburbs are outer-urban neighborhoods. The municipality of Shanghai is actually much larger, with 19 million people, but Chinese municipalities routinely include suburbs and even rural hinterland (however, Shanghai and Beijing municipalities are roughly coterminous with the metro areas). And Mumbai’s population number is for the entire city, not just downtown. Mumbai is just much denser than Shanghai. Incredible how similar this map is to Tokyo’s train system. Japan is often lauded for its shinkansen/HSR network, but is often forgotten for its metro networks. Part of the reason its HSR works so well is, in part, due to its well designed metro networks in the Tokyo and Kansai (Osaka) regions. In China about 2 Million workers in the moment are builting rail-systems. About half of them new underground lines. In average every month (!) 14 new underground stations are built. No other country, not even the US, has a workforce or money like this. This is an old article, so I’m not sure if my reply will be read by anyone, but I’d like to address the comment regarding Shanghai has having more rapid transit than the entire country of Japan. The line between rapid transit and railway is blurred in Japan; the distance between railway stations in major metropolitan areas is many times similar to what westerners consider ‘rapid transit’. Couple this with the fact that many rail lines operate at rapid transit-like frequencies i.e. every 5 minutes during peak hours and it’s hard to not consider many rail lines as ‘rapid transit’. The insides of most rail cars in the Tokyo area look the same as subway cars with seats lining the walls so there is a large space in the middle of the cars for people to stand; in fact, some rail lines are so crowded that the seats fold up during rush hour so it’s standing room only! It’s hard for outsiders to understand Japanese transportation because when westerners look at the data and information, then try to understand it all based on what they already know i.e. western transportation. So here’s a statistic to ponder: the Tokyo subway carries close to 7 million daily passengers; railways in the Tokyo metropolitan area carry over 20 million daily passengers. Next tidbit to think about: the most ridden line in central Tokyo is the Yamanote Line, a ‘rail line’, with 3.5 million daily passengers. It operates at 2 minute frequencies during rush hours. Last fact: all Tokyo subway lines except 3 have through-service on a rail line operated by a different company than Tokyo Metro or TOEI (the 2 subway operators). Even after reaching the last stop on a subway line, this does not mean the tracks end. In most cases, the tracks continue onto a rail line and subway trains continue to make stops on the rail line just as if it were still in the subway. Sometimes subway trains will travel 50 km further after reaching the last subway station. To consider one’s self as having a comprehensive knowledge of transportation, one needs to study and understand what goes on in Japan. It is completely unique compared to anywhere else in the world and therefore hard to understand if you try to apply what you know of western transportation. 1) On the older (and busier) lines, many of the stations do not have platform-screen doors. This poses safety threats. 2) Some stations still do not have disabled-accessible features – that is, the lack of lifts and ramps to access the platforms. 3) Lack of careful planning, as seen on Line 6. It is the only line serving the heavily populated Pudong area, but still uses trains with 4 C-car carriages (as a result of not renewing the population data of Pudong for 7 years), resulting in severe crowding during peak hours. The same goes for Lines 1 and 8, where authorities had undercalculated the ridership rates. It is better nowadays, after the mad rushes before Expo 2010. The Metro authorities have reviewed the problems and pledged to solve them. Newer Lines, 10 and 11, do seem to be much better than older ones. We can just hope that the construction groups will now turn their focus to quality rather than speed to build the remaining lines, now that all the main lines are completed. In a few years (about 2016) the underground of Shanghai will be even double as big as now around 720 km. As long as from London to Scotland! There are just new plans to built another 80 km metro in Shanghai. When ready in 2020 Shanghais metro will be about 60% longer than the longest in the western world – the London underground. The REAL track length of the NYC rapid transit system is 1957 miles (3149 km). It is absurd not to include Long Island RR and Metro North. The same goverment agency owns all of these. Shanghai has a long way to go to even come close. Le progrès ne vaut que s'il est partagé par tous. U.S. transit systems are shedding riders. Are they under threat?